The award-winning Audioengine 2 speakers just got better. With a built-in digital-to-analog converter (DAC), the Audioengine 2+ allows you to send high-quality digital audio direct from your computer’s USB port. We've also added an output to connect a subwoofer and you can even go wireless with the optional Audioengine W3 adapter. The Audioengine 2+ is a great introduction to high-quality audio and the perfect upgrade for your computer or iDevice. The Audioengine 2+ is the new standard for computer audio and these small, but high-performance speakers are the perfect upgrade for your computer. Everyone knows the difference between custom-built, small batch products and the disappointment of mass-produced and over-marketed products. The A2+ was designed and hand-built with the goal of exceeding expectations of both value and performance. The Audioengine 2+ is about one-third the size of our flagship Audioengine 5+ powered speakers and an ideal size for your desktop or smaller room. We used the same custom tweeters as in the Audioengine 5+, matched them with compact Kevlar woofers, then added high-performance amplifiers with high-quality connectors. All this great engineering is wrapped in wood cabinets with a hand-polished finish to create a premium quality desktop multimedia speaker system that puts all those sad plastic computer speakers to shame! To say that the bass on the Audioengine 2+ is substantial for their size may be an understatement, but you should be the judge. The bass was teased from the A2+ with some clever acoustic and electrical design without using any digital signal processing or fake bass boost circuits. Wood remains a preferred speaker enclosure material for its stiffness at higher volume levels and the cabinet focuses just the right amount of low end from the tuned front port slots. The A2+ was designed for your desktop but their superb soundstage and imaging also makes them the perfect choice for across the room. Well-suited for all your music, movies and games, the A2+ sounds great with or without a subwoofer. Using a similar analog design as the Audioengine 5+, the A2+ power amplifiers are built inside the left speaker providing a very efficient system. An auto-standby idle mode is also included to conserve power when you're not playing music. The A2+ features analog amplifiers that are built into the left speaker, while the right speaker is passive so setup is simple. Just plug the left speaker into AC power and connect the included speaker wire from left to right. We’ve included minijack, RCA, and USB inputs for easy connection to your computer or iDevice and other cables you may need are included. There is no software or plug-ins to install and A2+ works with any computer or music player. The A2+ also has a variable RCA output for connecting a subwoofer, upgraded connectors, improved accessory cables, and a redesigned power supply. 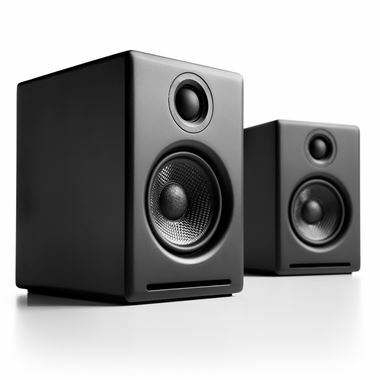 The Audioengine 2+ sets a new level of audio and aesthetic quality for Powered Multimedia Speakers and further closes the gap between computer speakers and home audio. Even if you're not an audio enthusiast, we guarantee you will still hear a difference! This product is now sold out and cannot be purchased.